Why hike to the Vernal Fall footbridge? Sure, if it were up to you, you'd run to the top of Nevada Fall, walk back down on your hands, then do the Upper Yosemite Falls trail in the afternoon. But if you've got workout-averse sightseers in your party holding you back, you can bring them to the footbridge so they can get a taste of the Mist Trail without getting the full stairmaster experience of climbing to the top of Vernal or Nevada Falls. OK, what is the Vernal Fall footbridge? A mile from the trailhead, the Mist Trail crosses a footbridge from the north to the south bank of the Merced River. You'll get your first sight of Vernal Fall here, as well as pleasant views of the river both up and downstream. There are also bathrooms and potable water on the far side of the bridge. It's generally the first breath-catching point for hikers on their way to the top of the Mist Trail or Half Dome. Difficulty: It's a short hike, but it's still a stretch to call it easy. There's enough climbing here to make you sweat, so call it a 4 out of 10. At least if you sprain an ankle here, there will be lots of other hikers around to lend you a hand or a walking stick. Best Time to Visit: In the spring, when it looks like the photo on this page instead of like this. 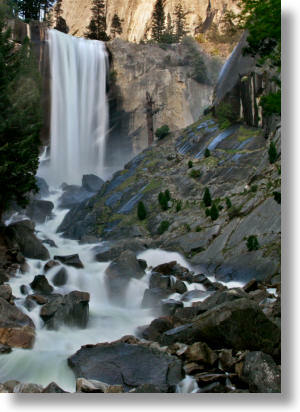 True Confessions: See the photo of Vernal Fall at the top of the page? That's not actually the view from the Vernal Fall footbridge. The passage of time and concomitant growing of trees have rendered the view of the falls from the footbridge less spectacular than it used to be. It's still worth the trip, but if you've made it all the way to the footbridge, you really should proceed a few hundred meters farther up the trail to get a clearer view of this world-class waterfall. If you're looking for a turnaround point, just keep going until you first feel the spray from the falls (assuming it's springtime or early summer and the falls are near peak flow). It's not really a trip to Yosemite if you don't take a little bit of Vernal Fall back with you. Crowd Factor: High. This is one of Yosemite's most popular trails. Nearest Bathrooms: At Happy Isles, which is just across the river from the trailhead, and at the footbridge itself. Nearest Snacks: General store and assorted restaurants at Curry Village, a bit under a mile west of the trailhead. Getting There: The trailhead is near the southeastern end of Yosemite Valley. Follow the signs to Curry Village and you'll get into the vicinity of the trailhead. The shuttle buses stop at Happy Isles, so you can also park at one of the lots near Yosemite Village and catch a free ride to within hailing distance of the trailhead. Parking: The nearest parking is at the trailhead parking lot, roughly half a mile from the trailhead. If you continue past Curry Village to the Upper and Lower Pines campgrounds area, you'll reach an intersection where a left turn takes you to the campgrounds and going straight appears to be prohibited - there's one sign claiming that the road ahead is restricted to service vehicles only and another indicating that there's parking ahead. It turns out you're allowed to drive down this road as far as the trailhead parking lot, which is as close to the trailhead as your car can legally get. This lot often fills up, though. Just about everyone who's climbing Half Dome today got here by 6 a.m. and won't be back for several hours. If it's full, try the large day-parking lots at Curry Village and Yosemite Village. You can take the free shuttle buses to the trailhead from either of these lots, and from Curry Village you're also only about a mile's walk from the trailhead. Hazards: If you've been to the Half Dome page, you may have read that more than 20 people have died at various points along the Half Dome trail. What isn't mentioned there is that the majority of them died along the Mist Trail section of the Half Dome route, including some at the Vernal Fall footbridge. The rocks are slippery and the water is fast, and if you lose your balance and fall into the river near the footbridge, chances are that you'll drown before anyone can get to you. So keep your distance from the river, and if you want to get close to the water, hike up the trail and soak in the mist from the falls.